Denton, TX - This gas well on the Rayzor Ranch development has been at the center of quite a bit of controversy. This well is across the street from a park and populated residential area. 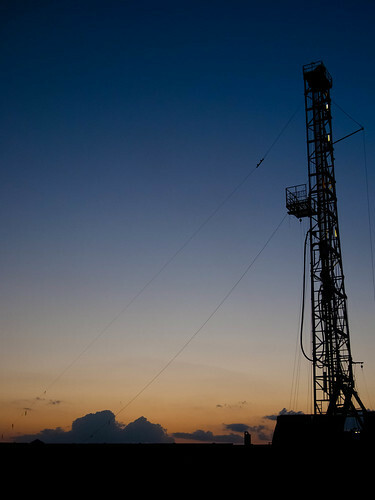 The way mineral rights are handled in Texas is very corporate friendly and gives very little consideration to the impact operations like this have on the lives of the people who have to live around these things. The well is quite noisy and it seems to smell. You can read more about the controversy surrounding this particular operation here (http://www.facebook.com/group.php?gid=105689918458). This particular well is exploiting the natural gas reserve in the Barnett Shale. This photograph was taken at McKenna Park on Bonnie Brae Ave.